Save 10% on supplies with your WorkCentre 6515 purchase (available at checkout). Right out of the box, the WorkCentre 6515 is ready for the way you work. With standard Wi-Fi connectivity, the WorkCentre 6515/DNI configuration gives you untethered mobility and the freedom to put your device right where you need it. Tools such as our new Wi-Fi® installation wizard, Wi-Fi Protected Setup™ (WPS) and Wi-Fi Direct® make it simple to get connected (securely). 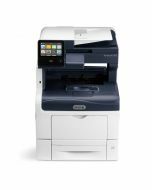 You can print emails, photos and important documents from a wide array of mobile devices, instantly, and without complicated setup with Apple® AirPrint®, Google Cloud Print™, Wi-Fi Direct®, Xerox® Print Service Plug in for Android™ and Mopria®. Additionally, Near Field Communication (NFC) Tap-to-pair enables simple, direct connectivity from supported mobile devices. Our easy-to-use color touchscreen interface offers an app-based, tablet-like user experience that uses gestures and multi-touch interactions. Customize it to match your workflow and navigate with intuitive, smartphone-like swipes and gestures. 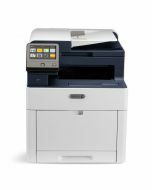 The WorkCentre 6515 Color Multifunction Printer uses our new Xerox® EA Toner formulation, which has been re-engineered to provide better image quality and less toner waste. Smaller toner particles translate to finer details, and with 1200 x 2400 native dpi, your printed materials will have stunning resolution. And because it melts at lower temperatures, it saves energy too. PANTONE® Color-approved solid color simulations and Xerox® color correction technology ensure results that match your expectations. The space-saving WorkCentre 6515 helps you conserve energy and reduce supplies costs by combining the functions of a copier, printer, color scanner and fax into one affordable device. Targeted at workteams of 2 to 7 users with print speeds up to 30 ppm, it is perfectly positioned to support the demands of your growing business. An optional second paper tray lets you load an extra 550 sheets at one time for extended interruption-free printing. Save time by simultaneously scanning both sides of a two-sided document at up to 30 impressions per minute. And Scan preview lets you see your scanned file before you send it. Remove unwanted pages, check accuracy and save valuable time. The WorkCentre 6515 is built to simplify and automate profit-killing, time-consuming tasks. Our redesigned Embedded Web Server is easy to use and responsive, so you can easily manage your multifunction printer at your desk or on the go. Keep your sensitive documents away from unintended recipients with the latest security features, including IPsec, SNMPv3, IP filtering and secure print. With just a few simple steps, your multifunction printer is ready to scan or print directly to or from the cloud (Xerox Mobile Link will be available in early 2017) . Scan to Email, FTP, Network or somewhere more down to earth—like the integrated front and rear panel USB ports. Document Handler Single-pass Duplex Automatic Document Feeder (DADF): 50 sheets: Custom Sizes: 5.5 x 5.5 in. to 8.5 x 14 in.